Could not create a Rescue USB for Macrium Home Edition v 6.3.1855 Tried 2 USB Flash drives on 2 notebooks. Always the dame answer. Install Wizard said "Installation Successful", however when I tried to boot from the Rescue USB it said Missing Operating System. What's going on? I found an old USB Rescue drive and used it to boot each notebook; one running Win 10 the other Win 7. How come I am unable to create a new USB Rescue device that works? The Create Rescue Media wizard doesn't have an install wizard, and it never says "Installation Successful". Are you sure you're going through the correct process? If you're running the actual Reflect installer and telling it to install onto your flash drive, that isn't what you're supposed to do. 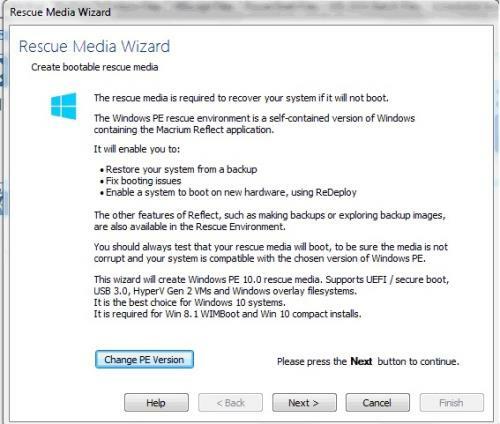 You install Reflect onto your PC normally, then inside Reflect you go to Other Tasks > Create Rescue Media, as documented on this page of the online user guide. phughan said, "it never says "Installation Successful". After booting from the Rescue media instead of starting it says "Operating System Missing." The first screenshot is a creation wizard, not an installation wizard, and nothing in the second screenshot you posted contains the word "installation". I just wanted to make sure you were following the correct process, because your initial description suggested that you might have been trying to literally install Reflect onto a flash drive. Do you know if the systems you're working with boot in Legacy BIOS or UEFI mode? Have you tried the manual flash drive preparation mechanism here? I'd recommend formatting it as FAT32 rather than NTFS since that will allow both Legacy BIOS and UEFI booting. Do you have any third-party anti-virus on your system that might be blocking certain boot-critical files from being copied onto that flash drive? Have you successfully booted any other environments from those flash drives previously, such as generic Windows 10 installation media created with the Microsoft Media Creation Tool? I manually created an MBR with diskpart. The Rescue drive now loads Win 10 PE and Macrium Reflect. I thought Macrium would create a bootable flash drive as part of the routine for creating a Rescue drive.. Seems like I've read something about how the Rescue Media Builder is not destructive with regard to creating partitions. Sorry I can't provide a reference but I wonder if OP's rescue USB stick initially had one large NTFS partition (or something else) which caused the problem. Starting with 7.2, Rescue Media can operate destructively, per the USB Flash Drive Formatting section of this KB article. But if the OP is trying to boot the Rescue Media in UEFI mode and didn't select the multi-boot option, then Reflect would have allowed an NTFS partition to be used even though that wouldn't be usable on most UEFI systems (except the small handful that added native NTFS support, which is optional in the UEFI spec). Haha I guess I'm old hat.